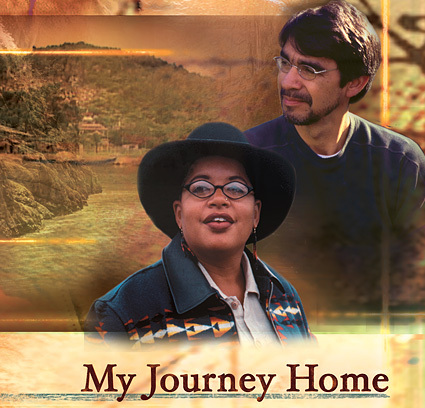 My Journey Home traverses the conflicted, cultural landscape of the United States, through the perspective of new American voices known and unknown – writer Faith Adiele, journalist Andrew Lam, and Armando and Carlos Peña, two brothers from an ordinary family that has weathered extraordinary times. In a feature length, two-hour documentary, we will follow their journeys home as they try to come to grips with the America of their past and future. On the road in this country and beyond, Lam, Adiele and the Peña brothers will encounter a nation transformed. It is not the old America of homogeneity and fixed boundaries, but a new global society of suburban Little Saigons, Mexican and Korean communities in the middle of the Great Plains, and cities where Islam and Buddhism are the fastest growing religions. At the heart of each story will be the drama of a personal search, revealing biographies that are provoking, humorous and emotionally devastating. Producer Renee Tajima-Peña has chronicled the American scene in documentary films such as Who Killed Vincent Chin, nominated for an Academy Award in 1988, and MY AMERICA… or Honk if You Love Buddha, honored at the Sundance Film Festival in 1997. Her other credits include The New Americans series on PBS, The Last Beat Movie, The Best Hotel on Skid Row, Jennifer’s in Jail and the PBS special Declarations: All Men are Created Equal? Tajima-Peña’s works have been honored with, among others, a Peabody Award, a duPont-Columbia Award and the Justice in Action Award. She previously worked as a film critic for the Village Voice and a cultural commentator for National Public Radio and now is an associate professor at the University of California at Santa Cruz. For the past 20 years, producer Lourdes Portillo has made award-winning films that focus on the search for Latino identity. The Mothers of Plaza de Mayo, the result of a three-year collaboration with writer/director Susan Muñoz, was honored with a 1985 Academy Award Best Documentary nomination. Several PBS documentaries followed, including La Ofrenda: The Day of the Dead, Selena: A Home Movie and The Devil Never Sleeps. Portillo recently finished a documentary called Missing Young Women about the killings of hundreds of young maquiladora workers on the border between the United States and Mexico. Ray Suarez is a senior correspondent for The NewsHour with Jim Lehrer on PBS, where he is responsible for conducting newsmaker interviews, studio discussion and debates, reporting from the field and serving as a backup anchor. Prior to joining the NewsHour in 1999, he was host of the nationwide, call-in news program “Talk of the Nation” on National Public Radio. Suarez also wrote the recent book The Old Neighborhood: What We Lost in the Great Suburban Migration: 1966-1999 (Free Press), and has contributed to several others, including Totally Brooklyn (Workman, 2001), Saving America’s Treasures (National Geographic, 2000), Las Christmas: Favorite Latino Authors Share Their Holiday Memories ( Knopf, 1998), and About Men (Poseidon, 1986). His essays and criticism have been published in The New York Times, The Washington Post, The Chicago Tribune and The Baltimore Sun, among other publications. This Program Is A Production Of WETA Washington, D.C. Who Is Solely Responsible For Its Content.